Mustang Tiji Festival Trek is the trek into the forbidden kingdom of Mustang. It has vast, arid valleys, eroded canyons, ochre valley and yak caravans with colourfully painted mud brick houses. Mustang has been able to attract the world from the past several years. Due to its extreme cultural diversity and topographical variation, this is an unforgettable trekking experience ever in Nepal. The walled city of Lo Manthang is the unofficial capital of Mustang. It still remains Kingdom which was a part of the Tibetan Kingdom of Gungthang until the 1830s. Tiji Festival in Mustang is an old festival, it was following since long time back. It is famous not only in Upper Mustang but also among all the travellers from the world. Tiji Festival is a three-day ritual festival celebrating on May 14th, 15th, and 16th. This is a popular and colourful Buddhist festival as well as the most important and colourful festival of Upper Mustang. 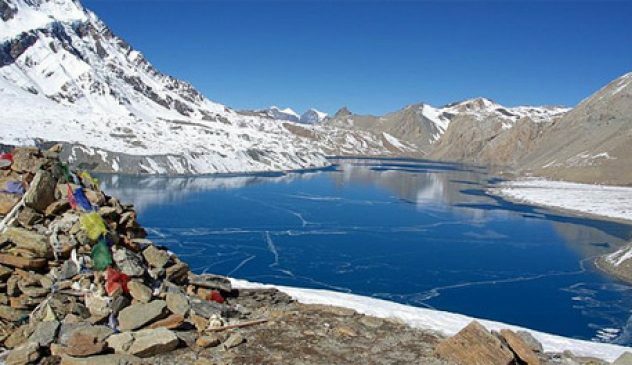 This trek is an exotic tour to unspoil ancient Tibetan villages, rare medieval Buddhist arts, the exotic culture and the unique beauty of the Himalayan desert. Tiji festival is also known as “The chasing of the Demons” and lies on the Tiji myth. Tiji tells the story of a deity named Dorje Jono who battle against his demon father to save the Kingdom of Mustang from the destruction. The demon father creates damage on Mustang by creating a water shortage in this extremely dry land; is the most precious life-sustaining resource. Dorje Jono eventually defeats the demon and banishes from the land. The reason for celebrating this festival is praying God for water and good crops. During the festival, the monks dress in traditional manner and masks and dance which helps to drive the evil spirits away. Villagers from all over the kingdom of Lo Manthang come in the Tiji festival to watch the dance and to participate. Mustang Tiji Festival Trek starts after a flight to Jomsom. With enjoying natural diversity our trail passes through the Sherpa villages of Kagbeni, Chele, Ghiling, and Chharang to Lo-Manthang. You will hike through deep canyons and amazing rock formations backed by snow-capped peaks. You will visit different homes, villages, and active monasteries in ethereal landscapes on the edge of the Tibetan Plateau. It is forbidden & isolated from the rest of the world however this festival is able to evolve its own distinctive culture and traditional which is rich & unique. During this Trek, you’ll see the extraordinary and amazing things that will be hard to believe but true in Mustang. After enjoying this festival trek of Mustang, we trek back to Ghami, Samar, Kagbeni and lastly to Jomsom for the returning flight to Pokhara. People who want to visit Mustang need to pay a special permit fee. Also needs to apply from any of the government registered Trekking agencies in Nepal. The Mustang Tiji festival normally held at the end of dry winter/spring season effectively a spring renewal festival and will usher in the wetter monsoon season; this season is also familiar as the growing season for Mustang. Tiji festival trekking of Nepal is the unique privilege to witness; the same color, costume, dancing and ritual that were displayed by these people in this place more than six hundred years ago. Day 01: Greetings at Kathmandu Airport. Day 02: A full day sightseeing tour of Kathmandu. Day 17: Pokhara to Kathmandu, 25 minutes flight or 6-7 hour drive. We will meet you at Kathmandu Tribhuvan International Airport and transfer to your hotel. When you have had your time to settle in and freshen up, you will be invited to visit our office for a briefing about your program. You will have a meeting with your trekking guide and discuss the equipment needed for the trekking. We will process and finish all the trekking permits and documentation works. If you arrive at night we will have the same discussion in next day morning after your breakfast. After breakfast, you will leave for a full day sightseeing tour around Kathmandu valley. You can visit sacred Pashupatinath Temple and Swyambhunath, very ancient and essentially enlisted in UNESCO World Heritage sites. The biggest Buddhist Stupa at Boudhanath and the fine arts and historical architecture of Kathmandu Durbar Square reflecting the ancient Nepalese culture are highlighted on our guided tour. On return to your hotel, you will have time to explore the local popular streets. We will drive you to the Domestic Airport for 25 minutes flight to Pokhara. Or if you wish you can take a Tourist bus to Pokhara about 4-5 hour drive exploring & enjoying with scenic beauty all the way around. Pokhara offers magnificent views of Dhaulagiri, Manaslu, Machhapuchhare and others. In the evening, a boating trip on Phewa Lake will be followed where you can enjoy the spectacular views of Annapurna Himalaya Range. Visit Bindavasini Temple lying in the middle of the lake and enjoy the lakeside. We will take a flight early in the morning to Jomsom of about 25min with spectacular views of Mountains. From here onwards it is very windy in the afternoon; the trail is quite barren with craggy rocks and sand and is mostly flat. 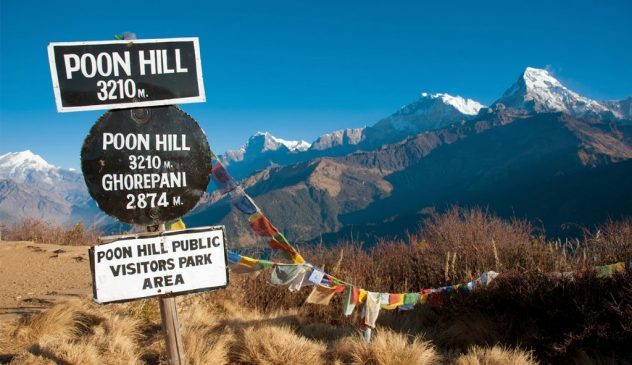 The picturesque peaks of Nilgiri, Dhaulagiri, Tukuche Peak and Dhampus are spectacular all the way. You walk on gently undulating trails to reach Kagbeni. 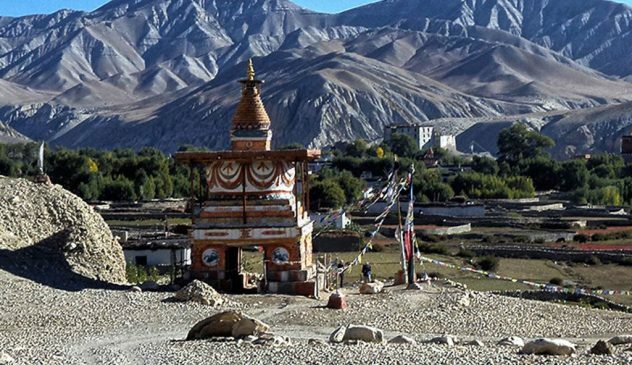 Kagbeni provides you with a taste of scenes to come in upper Mustang, with its narrow alleyways and tunnels, irrigation canals, green fields of wheat and barley. Next day journey starts with a special permit check up onwards to the riverbank of Kali Gandaki upstream. We enter upper Mustang and follow the east bank of the river over a series of small ridges. The trail leads us through the scenic picturesque villages surrounded by fields of wheat, barley and buckwheat, interspersed with small apple orchards. We trek forward crossing the river heading up to the huge red chunk of a conglomerate that has fallen from the cliff above forming a tunnel through which the Kali Gandaki follows. 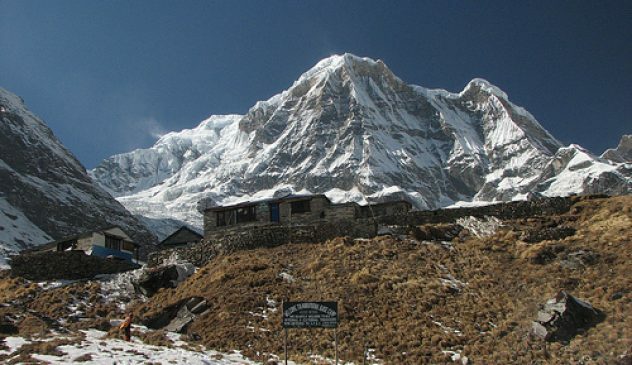 The trek now leaves the Kali Gandaki valley and climbs steeply up a rocky gully to Chele. The climb continues along steep, treeless and dry terrain, along the side of a spectacular deep canyon to pass a cairn of rock. Climb above Samar and descend into a large gorge and go into another valley along the surrounding of cool streams and junipers trees, crossing a stream and climbs up to a ridge at 3800m. We climb to Taklam La Pass (3,624m/11,923 ft) through plateaus and narrow stretches with views of Tilicho Peak, Yakawa Kang and Damodar Danda. Nyi Pass is the highest point of the trek thus far and the southern boundary of Lo. The trail then drops steeply to the whitewashed buildings of Ghiling. The track descends below the blue, grey and red cliffs across the valley to a steel bridge across the Tangmar Chu. Then climb to a plateau and passes the longest and most spectacular Mani walls in Nepal. From the end of the wall, the trail heads east to the village of Charang (Tsarang) with a maze of fields, willow trees and houses separated by stone walls at the top of the Charang Chu canyon. At the eastern end of the village, are huge Dzong [fortress] and a red Gompa which houses an excellent collection of statues and Thankas as well as many large paintings of seated Buddha’s. 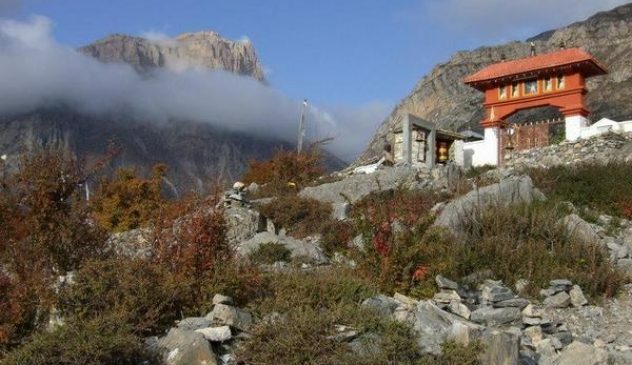 The trail descends about 125m from Charang, crosses the Tsarang Chu and follows the track to a cairn on a ridge opposite the village at 3580m, then enters the Tholung village. Then the trail further ascends gently to the 3,850m windy pass of Lo, from where you can see the Lo-Manthang Valley (3700m), views of the walled city appear magnificent with its hills on the Tibetan Border. A short descent leads onto the plain of Aspiration and then the trail crosses a stream and climbs up onto the plateau of Lo-Manthang. Early in the afternoon, horns resounded, announcing the two twelve-foot copper dunchens, with their elephantine blurting, followed by two double-reeled horns, all accompanied by drum and cymbals. Late afternoon, in high wind and blowing dust, eleven lamas in maroon and gold, wearing high red hats, came from the palace and take their places along the wall beneath the thanka, with Tashi Tenzing on the elevated seat just in the center. The masked dancers start the portrayal of the Tiji myth then Dorje Jono repels the demon through the power of his magical dancing. As the dances end, Dorje Jono kills the demon, after which his people are relieved of their plague of misfortunes, water becomes plentiful once more, and the balance and harmony of existence are restored. On the second day of Tiji, We’ll see Tibetan women in their traditional clothing and colorful jewelry, monks in their robes and dancers in elaborate costumes. The King of Mustang “wears a whole crown of tiny river pearls set off by dozens of large red coralline tones interspersed with matched ornaments of turquoise. The costumes and masks, the twelve-foot horns, the gold cups of wheat, the butter cakes, the snow peaks and wind and dust and sun, the mehti, snow leopard, snow pigeons, saligrams, the dying glacier and the desert ruins, the drunks and rajas and foreigners, the dogs and yaks. On the third day, Tiji ends with the ceremonial destruction of the evil remains, represented by some long black yak hair and red torma cakes minced to a dark red gurry. The demons red remnants are set out on an old tiger skin, whereupon they are attacked by bow and arrow, slings, and the old guns. The poor devils’ remains are overturned upon the ground, each time to a wild cannonade from the old muzzle-loaders and a wave of cheers and smoke. We will make our return take via highland rouge crossing the alpine meadows. After Lo Gekar, the trail climbs steeply to a cairn on a pass at 4000m, offering a last glimpse of Lo Manthang. Cross the Chogo La (4325m), the highest point on this trek. The trail makes descend beside a stream visiting ancient Ghar Gompa more than 1200 years old and meet the Guru Rimponche. Gompa is famous for its rock paintings and the legend of fulfilling our good wishes. The trail then drops steeply to the whitewashed buildings of Ghemi. Ghemi is surrounded by large fields most of which are barren. Today we continue down the valley to Ghiling in a dusty and windy trail. The trail leads passing through the arid plateau and crops field in between, the walks may not be pleasant on the back as we suffer the wind on face in Kali Gandaki wind valley. Arrive Samar; it is a small village with nice terraces and people follow the Tibetan lifestyle and tradition here. We will mostly walk along the bank of Kali Gandaki River with the views of natural vegetation and apple orchards to Kagbeni. Spend the night enjoying the ancient and uniqueness of the Kagbeni village. the last day of the trekking is an easy day and flat working in the river bank. The trail passes through Eklebhatti and continues working to Jomsom. Arrive at Jomsom; celebrate the last day of the trekking with the trekking crew. Early morning we will take a short picturesque flight to Pokhara. 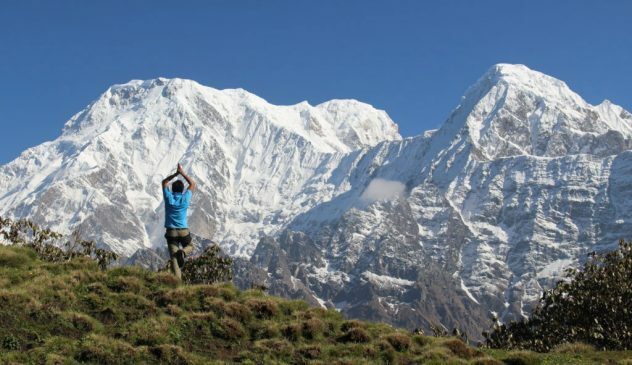 The view of Annapurna and Dhaulagiri mountains and world’s deepest gorge, Kali Gandaki are stunning. Relax whole day in Hotel or wander around Lake Side with fascinating mountains panorama view and nature charming. Take a flight or drive by tourist bus/Private car to Kathmandu. In the evening you can have your last night in Nepal enjoying the Nepali cultural dinner show, taking some beautiful snaps and making up your mind for the returning journey. You can have greetings exchanging among friends and with all Nepalese people. 3-night accommodation in Kathmandu on a twin sharing bed and breakfast basis.